For the last ten years I have worked as a freelance designer for non-profits, small businesses, and religious organizations in Lehigh Valley and southeast Pennsylvania. Shop for handcrafted soaps, vine-grown loofahs, and natural stone coasters. Sheila is creative, professional, prompt and always willing to go the extra mile to get the job done. I have and will continue to highly recommend her to friends and colleagues! 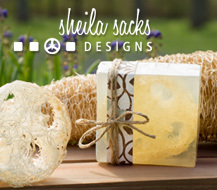 Sheila listens to your thoughts, understands your desired results and then creates beautiful designs. Whether it’s print, web or logo work, I — without hesitation — recommend Sheila. Sheila was highly recommended to me and I know why. Her reputation for diligence, timely work, and creativity is right on. Sheila has done work for me professionally and personally and I am impressed every time. Sheila took the time to listen to our goals and learn about our audience before designing our website. We are so pleased with the results! I am impressed with everything Sheila has done for First Moravian Church as well as the work she has done for me personally. I would recommend her to anyone who is looking for a talented and gifted graphic artist.